Festive beverages contain up to 14 spoonfuls of sugar per cup, new research has revealed. Researchers looked at the sugar and calorie content on some of Britain’s best-loved Christmas drinks and found that some contained almost a quarter of an adult’s recommended daily calorie allowance. The online marketplace looked at drinks from major vendors including Pret a Manger, Greggs and Costa Coffee – and found that Caffè Nero’s Belgian Truffle hot chocolate had the highest sugar content at 56.9g (the equivalent of roughly 14.2 teaspoons). The chocolate-flavoured treat also contains 435 kcal – almost a quarter of an adult’s recommended daily allowance (RDA) according to NHS guidelines. But it was far from the highest in the calorie stakes with Pret a Manger’s orange hot chocolate containing an eye-watering 454 kcal per cup. For the research, the drinks selected contained semi-skimmed milk and the cup size opted for was regular (roughly 12 oz or 341ml). The festive drink containing the most grams of sugar is the Belgian Truffle Hot Chocolate released by Caffè Nero, with a regular cup containing a whopping 56.9g of sugar; around 14 teaspoons of sugar. 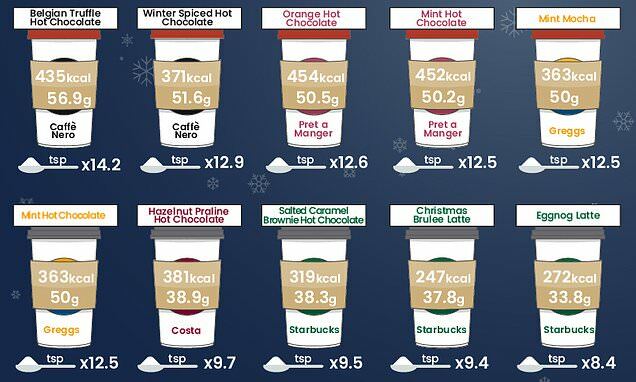 Pret a Manger’s Orange Hot Chocolate came in third place (50.5g), followed closely by their Mint Hot Chocolate (50.2g) – just under 13 teaspoons of sugar. 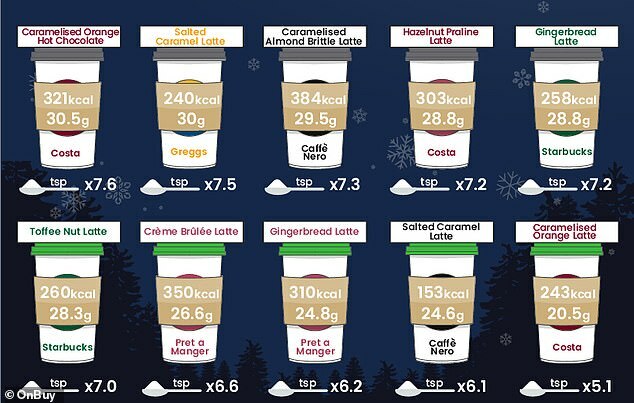 At the other end of the scale, OnBuy.com found that Starbucks’s Toffee Nut Latte is the fifth ‘jolliest’ festive hot drink, containing 28.3g of sugar – a 28.6g difference from the sugar heavy Belgian Truffle Hot Chocolate offered by Caffè Nero. It should be noted that while ‘regular’ was chosen, the measurement is approximate, and Starbucks measure their hot drinks in fl oz. 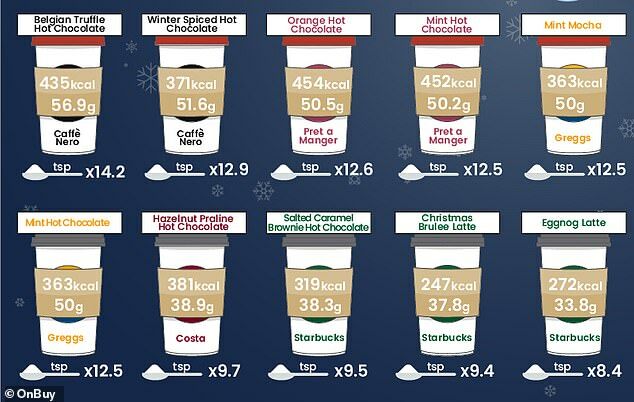 How many calories are in my favourite Christmas drink? When are the last Christmas 2018 posting dates for UK cards and parcels? And what is the last date to post abroad?